Jesus is one of the greatest figures in the world. For Christians, he is the absolute greatest of all, but in Islam, he I just a highly respected prophet to the Jews. Given the sharp differences in the two understandings of Jesus, both can not be true. 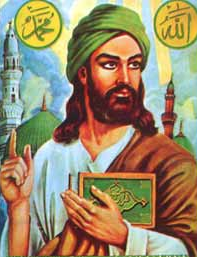 What does Islam and Muslim scholars say about Jesus? Hardly a single descendant of Adam is born without Satan touching him at the moment of his birth. A baby who is touched like that gives a cry. The only exceptions are Mary and her son" [cf. Q 3: 36]. Oddly we see some Catholic/Eastern Orthodox influence in this understanding were as Mary is seen as also sinless but the point is that Jesus is stated as being sinless. BUT this is the first major difference, Islam believes that Jesus was just another created person, except he was perfect. According to Islam, Jesus was nothing more than a perfect servant and THE example for Israel. BUT again, this is where sharp differences take form in exactly who Jesus is. Despite being a perfect servant and example performing miracles and having divine revelations requiring obedience; he is not to be worshiped. Two issues stand out. First, why is the Quran mentioning the worship of Mary too? We see again where the author of the Quran thinks that is what is being taught. Well, according to the Catholic Church this is true, but this was not true for all of Christendom. The idea for the worship of Mary began to develop around the 4th and 5th century with the development of the apocryphal The Book of Mary's Repose. The Armenian church accepted this idea and then John of Damascus became a proponent of its teachings which had been established in the East by Emperor Maurice around AD 600. Lets be clear, this is a much LATER created teaching that was not found in the earliest Church fathers. Here we see the author of the Quran picking up on this new-ish Catholic-Eastern Orthodox doctrine and assuming that is what the Apostles taught; which is untrue. Secondly, if Jesus was appointed as THE sinless prophet and example and spoke the revelations of God; why would God need to question him about what he taught? How could there be doubt about the truthfulness and faithfulness of Jesus? But it does not end there. To combat the historic teachings of Jesus, the author(s) of the Quran must then denounce other teachings that they disagree with. They denounce Jesus being taught that he is the Son of God. The Jews call 'Uzair a son of Allah, and the Christians call Christ the son of Allah. That is a saying from their mouth; (in this) they but imitate what the unbelievers of old used to say. Allah's curse be on them: how they are deluded away from the Truth! (9:30, Yusif Ali). But that was not the only teaching the author(s) of the Quran (misunderstood) disagreed with. Not only did Christendom teach throughout history that Jesus claimed to be the Son of God but also He was the Triune God. Clearly the author(s) of the Quran did not understand the teaching of the Triune God. The author declares monotheism when he says "Allah is one Allah". Yes. This is true. There is only one God. The Trinity also teaches that there is only one God. BUT the doctrine of the Trinity declares that Jesus is a person of the one Triune God and all glory belongs to the One Triune God. As confusion and misunderstanding continues by Muslims about what Christianity declares, the author(s) seem to draw their understanding of Christian teachings from writings denounced by Christianity. Despite the historical proofs of non Christian authors in regards to Jesus' crucifixion, the author(s) of the Quran seem to buy into a later gnostic teaching about Jesus' death. Modern Islamic scholars try to spin this as though this is only a metaphoric teaching in a spiritual sense but when we consider the earliest Islamic teachings we see what is actually meant by this statement in the Quran. Ibn Ishaq's (d. 761) report of a brief accounting of events leading up to the crucifixion, firstly stating that Jesus was replaced by someone named Sergius, while secondly reporting an account of Jesus' tomb being located at Medina and thirdly citing the places in the Qur'an (3:55; 4:158) that God took Jesus up to himself. Yet even within Islam, there are disagreement about whether Jesus himself was crucified. Ja’far ibn Mansur al-Yaman (d. 958), Abu Hatim Ahmad ibn Hamdan al-Razi (d. 935), Abu Yaqub al-Sijistani (d. 971), Mu'ayyad fi'l-Din al-Shirazi (d. 1078) and the group Ikhwan al-Safa agree with the historicity of the Crucifixion, reporting Jesus was crucified and not substituted by another man. Where did this substitution idea come from? We can find this idea expressed in the Gnostic Nag Hammadi documents Apocalypse of Peter (2nd to 3rd century) and The Second Treatise of the Great Seth (3rd Century). The First Council of Nicaea in 325AD rejected these writings as authentic and declared their teachings as heretical. So we see the author(s) of the Quran picking up these unauthentic teachings and adding their own spin to it. Muslims are told to respect Jesus as a legitimate prophet of God who spoke the words of God. Here we see the author(s) of the Quran agreeing that the Gospel from Jesus is divine. We are even in agreement that "the monasticism which they invented" is not from God. The gradual development of the Roman Catholic Church and Eastern Orthodox traditions and all its invented teachings are not from God and not found in the teachings of Jesus. Thus, Christians and Muslims agree that the teachings of Jesus are from God. The Quran teaches that they can not deny the Gospels. In fact, the Quran teaches the The Bible is of God. So what happen? When did the charge of corrupting the words of Jesus happen? Clearly it did not come from the time of Muhammad or from his followers after him. Islam was still trying to formulate an official Quran after the death of Muhammad and some of his close reciters. But once the differences of teachings within Islam were ironed out and the officially recognized version of the Quran was created; then the massive differences between the Bible and Quran became obvious. Dr. John Wijngaards pointed out: "In the Qur'an Muslims are told to respect the Gospel revealed to Jesus Christ and read by Christians. The Qur'an presupposes that the Gospel possessed by Christians is in fact identical with the original one proclaimed by Jesus. In the first four centuries after Muhammad (600 - 1000 AD) no Muslim theologian seriously contended that the Gospel texts were not authentic. They might accuse Christians of giving a wrong interpretation to the words; they would not dispute the words themselves. As studies of Muslim apologetics have shown it was only with Ibn-Khazem who died at Cordoba in 1064, that the charge of falsification was born." The Gospel of John was written only 60 or so years after Jesus lived. His gospel poses a problem for the core teachings of Jesus in Islam. The core theme throughout The Gospel of John is the deity of Jesus and Sonship- Son of God. Not to mention the specific record of the crucifixion of Jesus. Are these the corruptions? Clement of Rome, a disciple of the Apostles, quoted from the gospels as though they were the absolute authority of God spoken by Jesus himself. He was alive when eye witnesses of Jesus were still alive. He had no doubt of their authenticity. Quadratus of Athens even knew some who experienced Jesus' miracles first hand. Irenaeus of Lyons records who exactly wrote the gospels and he was alive during the time of the disciples of the Apostles. He does not question the authenticity of the gospels. Flavius Josephus, a Jewish non-christian historian, begins writing in the 1st century and he unintentionally validates what is recorded in the gospels as fact and authentic. If the gospels are of God and Jesus protected the Apostles from Satan; than the teachings of Jesus from the Apostles are not corrupted. Word variants may exist, but the teachings remain. Since Islam agrees that the Gospels are of God; what do the Gospels teach about Jesus? And these are only quotes from Jesus out of The Gospel of John. Many more can be found in the other gospels. The author(s) of the Quran failed to actually understand the teachings of Jesus and what was recorded in the gospels. They could not deny the divine nature of the gospels but had to explain why there was misunderstanding. They could not understand the sonship and divinity of Jesus; thus instead of agreeing a misunderstanding exists, they believed that it was the gospels that were at fault. The author(s) of the Quran ignorantly listened to early heretical teachings that distorted what the gospels actually taught; believing that these false teachings (corrupted Catholic and Eastern Orthodox traditions and Gnostic writings) were from the gospels, they then concluded that the gospels were corrupted when in fact it was their sources. Because the author(s) of the Quran concluded that they did not misunderstand the gospels about Jesus and that it was the gospels that were wrong; they then had to conclude that the gospels were corrupted in order to maintain the divine source of the original gospels. Arianism (rejected at the First Council of Constantinople in 381AD) teaches that the Son of God was created, denies the Trinity, and teaches that the Holy Spirit is just a power or force. Docetism (rejected at the First Council of Nicaea in 325AD) teaches that Jesus only appeared to be physically present on the cross but was not actually. The same ideas found in the Quran. The author(s) of the Quran got their understandings from heretical sources and not from the gospels. The Quran agrees with the gospels on minor details about Jesus but rejects the most important details of his identity.